Chris Hadfield's grand April Fools' Day finale shows him posing with an alien that just stopped by the station to say hi. When an alien parked a flying saucer at the International Space Station to say hello, astronaut Chris Hadfield turned to Twitter to report the earthshaking news. And if that sounds too good to be true … that's because it is. Hadfield, it turns out, is a prankster. Hadfield had a ball with April Fools' Day in space today (April 1), with the UFO stunt just one of his pranks. Earlier, the Canadian astronaut used his Twitter handle @Cmdr_Hadfield to post a photo of himself with space "grenades" he found on the station. It turns out, there were just harmless air sampling devices. Over the course of seven hours, Hadfield wrote five posts on Twitter slowly revealing his elaborate April Fools' Day joke. The picture he posted to accompany that post shows him posing with a flying saucer-like object off in the distance. His second photo is a little clearer, showing the UFO placed high above the Earth and on its way toward the space station. "Orbital debris seems to be on a course moving a bit faster than ISS," Hadfield wrote. "I'll try to take more pictures if it swings by." And "take" more pictures he did. The Canadian astronaut posted a photo of the flying saucer off in the distance with the orbiting laboratory's robotic arm in the foreground four hours after his initial post. "Wow, what a huge piece of debris! Maybe I can grab it with the Canadarm2…," Hadfield wrote. 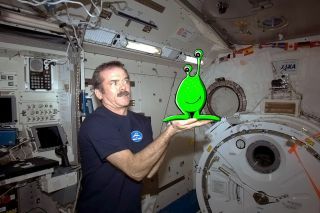 Hadfield's grand finale showed the terrified looking commander holding a small green alien away from him with both hands.Quickly after that, Hadfield wrote: "The object appears to be coming closer to the Station. I think it might be trying to board us!" Hadfield's followers were not so easily fooled. Many of his fans called the astronaut out on his April Fools' Day prank before it was even complete. Canadian astronaut Chris Hadfield "spots" a UFO in the distance: "The view from where we fly the Canadarm2, with some orbital debris off in the distance," he wrote on Twitter. "Astronaut humour," Ivor Tossell (@ivortossell) replied. "I didn't know they had Photoshop in space," Steve McPherson (@steventurous) wrote. Other followers played along with Hadfield's joke. "Quick someone give Canadarm2 a baseball bat #homerun," Pat Dunn (AstonPat) wrote. Chris Hadfield is the first Canadian commander of the International Space Station and has made a point of using social media, photos, videos and even sound to chronicle the experience of life in space. The effort, according to Canadian press accounts, has catapulted him to celebrity status in Canada. Hadfield leads the six-man Expedition 35 crew on the space station and is due to return to Earth in May. Two American astronauts and five Russian cosmonauts round out the crew.